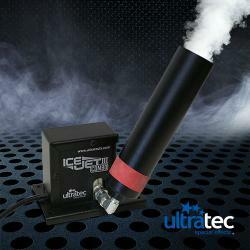 Ultratec's Ice-Jet III is an atmospheric effect that creates bursts of white dense plumes that resembles fog. It is operational using both high pressure and low pressure liquid CO2. It is available in 110 volts and 220 volts. The Ice-Jet comes with our standard One-Year Warranty on all parts and service.